Many of you may already know that I am beginning a ministry sabbatical next week. That means I will take a break from my online presence, including my social media accounts and blog. So, don’t be surprised if things go quiet from me over the next couple of months. I am doing well and looking forward to the chance to be still before God, to do some study, to have times of refreshment with my family and friends as I gear up for a new season of ministry in the Fall. You can read the entirety of a letter we sent out to the family of Eastbrook Church a couple of weeks ago below. Recognizing the importance for intentional pastoral care, the Council approved a sabbatical for Pastor Matt beginning May 10 and concluding on July 31. The goal of this sabbatical is rest, renewal, and some study with the help of a coach. We have engaged Gracebridge Alliance, a local ministry that encourages soul care for ministry leadership, to provide one-on-one coaching through the sabbatical and help in the transition back into ministry. A sabbatical is a time for rest and renewal and it’s a critical extension of the rhythm of Sabbath in our lives. Sabbaticals have proven to be healthy for the pastor, the pastor’s family, the ministry which the pastor shepherds, and the congregation as a whole. The sabbatical also includes thoughtful engagement of the congregation for prayer and refocusing alongside the pastor’s sabbatical. As you will read in Pastor Matt’s attached letter, the sabbatical was developed together in a harmonious spirit between the Council and him. 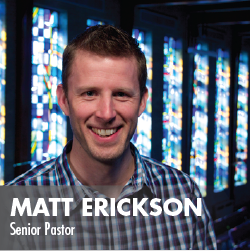 We want to assure the congregation that there are no issues with regards to Pastor Matt’s character, marriage, or relationship with the church. The intent is to sustain and refresh the life of our Senior Pastor so that he can make the best ministry contribution out of his best self within our church and beyond as we gear up to launch new initiatives this fall. What is our role during this sabbatical? Pray, encourage, and support Pastor Matt and his family. Pray specifically that his time with God will be refreshing and invigorating. Respect the Erickson family boundaries. As a rule of thumb, Pastor Matt will not be engaging in any “ministry related/work talk” during the sabbatical. Pray that the staff leads strong in his absence. Use this opportunity to refocus and to draw near to God via His word and in our prayer lives. There is a Q&A document with more specifics about how we are preparing for the summer during Pastor Matt’s time away, including background information on sabbaticals, what Pastor Matt will be doing during the summer, the preaching duties and guest speakers we will host, as well as, contact information. During the weekend of April 22/23, we will spend the last portion of the worship services in a time of discussion and prayer on the sabbatical. Council members will be available in-between services to answer any questions you may have. Thank you for your continued service “to proclaim and embody the love of Jesus Christ in the city and in the world.” Soli Deo Gloria! About three years ago, I was meeting with an older, seasoned pastor and talking about life and ministry. He asked me a number of questions, one being something I had never considered: “have you ever thought about taking a sabbatical?” He pointed out that Eastbrook had, by God’s grace, successfully walked through a major leadership transition that many churches and ministry leaders do not survive. He encouraged me to thoughtfully be aware of that reality and not to wear myself out, but instead to aim for being in ministry for the long haul. Out of that conversation came a discussion at the Council level related to how we care for our staff, including the idea of a pastoral sabbatical. It was with thoughtful consideration of the topic, that the Council granted me a sabbatical for this coming summer. I am thankful for this gift from the Council that we worked on together, and I believe it will be a good thing for me, my family, my ministry, our staff, and the church. Let me assure you that there is nothing wrong with me, my marriage, my character, or my relationship with the church. We are doing great and I feel like I am in a strong season of ministry. I also believe that as Eastbrook we are at a key moment to launch into some new ministry endeavors in the Fall, and I think this time of sabbatical will recharge me for that next season of ministry for us together as a church family. 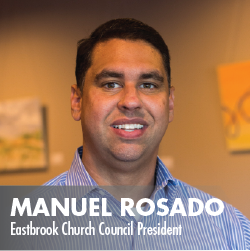 Thank you for your support, for your commitment to Christ, and for your commitment to this special, local body of Christ called Eastbrook. I look forward to sharing stories of how I heard from the Lord when I return after July. You can also read a Q & A on my sabbatical here.